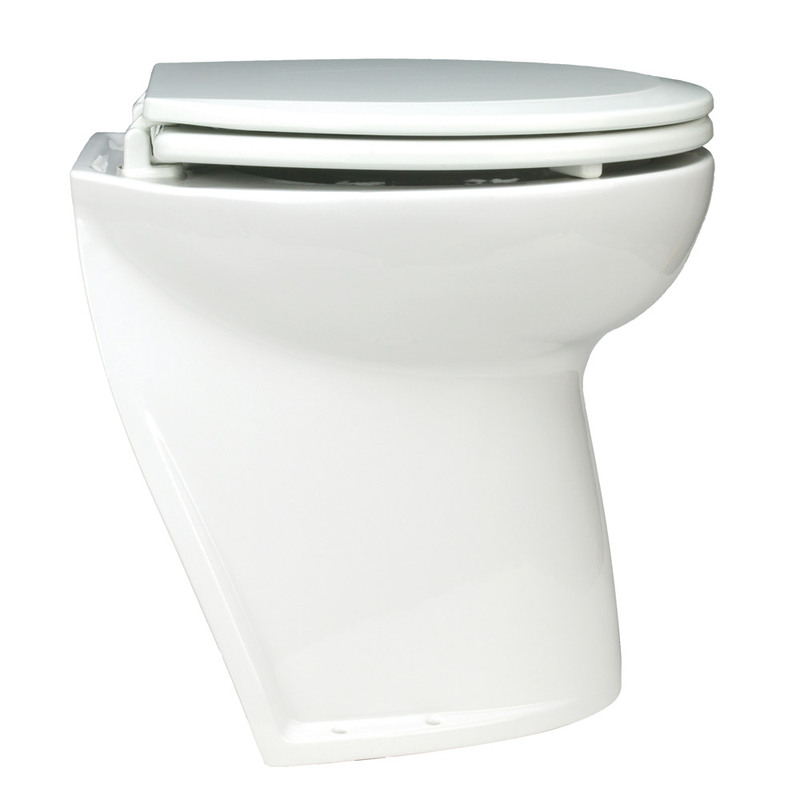 You may install JABSCO Deluxe Flush electrically operated marine toilet in both power and sailing craft, either above or below the waterline, for use onsea, river, lake or canal. The Deluxe Flush toilet range features a multi-function 'one touch' control pad offering four options - 'Fill', 'Quick Flush','Flush' or 'Empty'. In addition, the owner can set the control at any time so that the bowl is left either 'Dry' or 'Wet' after flushing. The recommended 'Dry' setting minimises total water usage. If water usage is not a concern, the 'Wet' setting automatically adds 1 quart (1 litre) of water after flushing, ready for the next user. Simultaneously holding down both 'Quick Flush' and 'Flush' buttons for 5 seconds switches between bowl always left 'Dry' and bowl always left 'Wet' modes. 'Fill' may be touched when the bowl is 'Dry' to add 1 quart (1 litre) of water before use, if thought necessary. 'Quick Flush' first rinses and then empties the bowl after light use. On 'Dry' setting, this uses less than 1 quart (1 litre) of water. 'Flush' rinses and empties the bowl twice after heavy use. If the bowl is 'Dry', touching 'Fill' first is recommended. This uses just 2.5 quarts (2.5 litres) of water. 'Empty' does exactly what it says without adding any water, whenever desired. Even when the bowl is apparently 'dry', there is an anti-odour water lock in the pump housing. WARNING: This product can expose you to chemicals including FORMALDEHYDE (GAS) which is known to the State of California to cause cancer. For more information go to P65Warnings.ca.gov. THETFORD ECO-SMART HOLDING TANK DEODORANT-FORMALDEHYDE FREE FORMULA-36 OZ. THETFORD ECO-SMART HOLDING TANK DEODORANT-ENZYME FORMULA-36 OZ. THETFORD ECO-SMART HOLDING TANK DEODORANT-FREE AND CLEAR FORMULA-36 OZ.